湖泊科学 2016, Vol. 28 Issue (1): 114-123. DOI: 10.18307/2016.0113. 梁康, 常军军, 王飞华, 刘双元, 梁威, 垂直流人工湿地对尾水的净化效果及最佳水力负荷. 湖泊科学, 2016, 28(1): 114-123. DOI: 10.18307/2016.0113. LIANG Kang, CHANG Junjun, WANG Feihua, LIU Shuangyuan, LIANG Wei. Purification ability of tail water and optimal hydraulic loading rates in vertical flow constructed wetland. Journal of Lake Sciences, 2016, 28(1): 114-123. DOI: 10.18307/2016.0113. 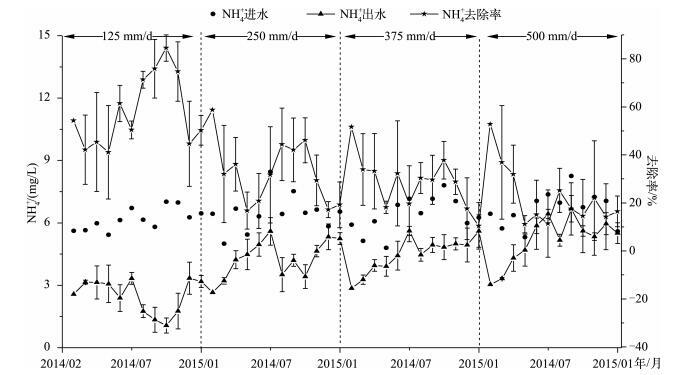 摘要：以污水厂尾水为处理对象, 研究垂直流人工湿地在4种水力负荷(125、250、375和500 mm/d)条件下的周年净化效果, 结果表明:秋季时系统的总氮去除率最高, 冬季则显著降低; 温度为10℃、溶解氧浓度为1.1 mg/L是反硝化强度显著降低的关键拐点; 总磷在冬季较其他季节净化效果高; 125 mm/d水力负荷下CODCr去除率显著高于其他水力负荷, 冬季CODCr去除率显著降低, 而其他水力负荷及季节下的去除效果没有显著差异; 当湿地以高去除率为目标时, 最佳水力负荷为125 mm/d; 当湿地以地表水水环境质量Ⅴ类标准为目标时, 最佳水力负荷为375 mm/d; 当湿地以污染物去除量为目标时, 最佳水力负荷为500 mm/d.综合推荐375 mm/d为最佳水力负荷. Abstract: Four vertical flow constructed wetlands were employed to evaluate the purification effects within tail water in different seasons under four hydraulic loading rates (125, 250, 375 and 500 mm/d). The results showed that the highest removal efficiency of total nitrogen was achieved in autumn while decreased significantly in winter. 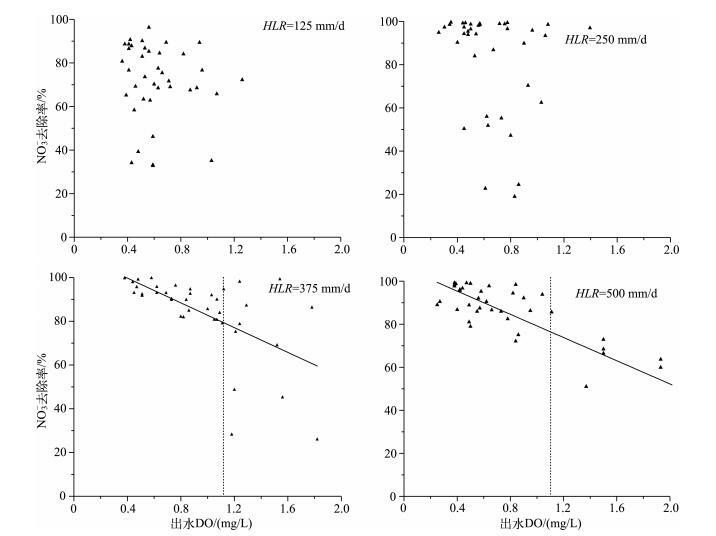 The key points of temperature and dissolved oxygen for denitrification were 10℃ and 1.1 mg/L, respectively. The wetland system was more effective for phosphorus removal in winter than in other seasons. 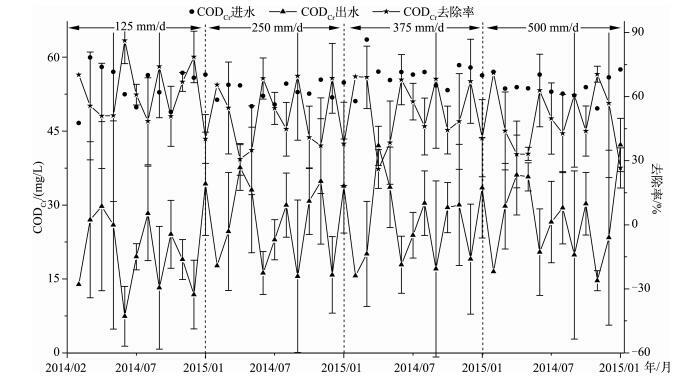 Removal efficiency of CODCr under 125 mm/d was significantly higher than that of other hydraulic loading rates, the lowest treatment performance of CODCr was achieved in winter, and with no significant variation in other hydraulic loading rates and other seasons. To obtain a full pollutant-removal efficiency of the wetland system, the optimal hydraulic loading rate is at 125 mm/d. 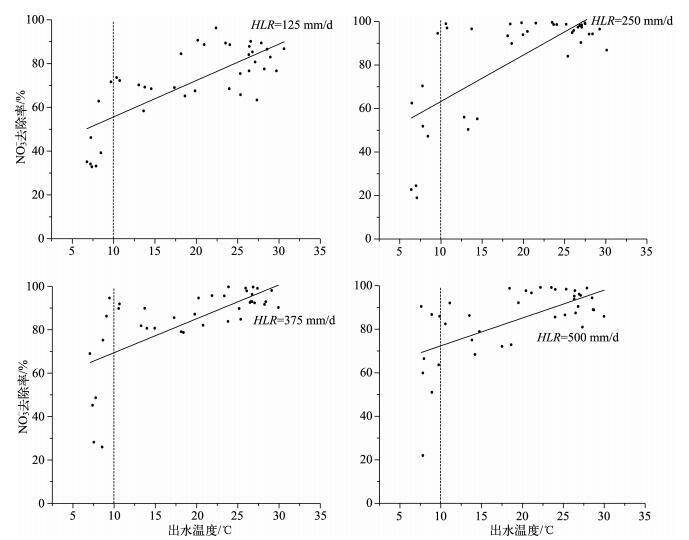 To reach the V class of surface water environment quality standard, the optimal hydraulic loading rate is at 375 mm/d. To receive the amount of pollutant removal, the optimal hydraulic loading rate is 500 mm/d. Based on full consideration, the optimal hydraulic loading rate should be at 375 mm/d. 垂直下行流人工湿地小试系统位于中国科学院水生生物研究所东湖官桥实验基地(30°30.39′N，114°28′E)，由4组相同规模(长×宽×高＝1.25 m×1 m×1 m)的下行流人工湿地组成.填料高度75 cm，分为上、下2层，下层为40 cm粒径为10~20 mm的砾石，上层为35 cm粒径为5~10 mm的米石.选择芦苇(Phragmites australis)作为湿地植物，种植密度为10株/m2.实验系统建于2013年11月，调试运行3个月至系统稳定，于2014年2月底开展研究. 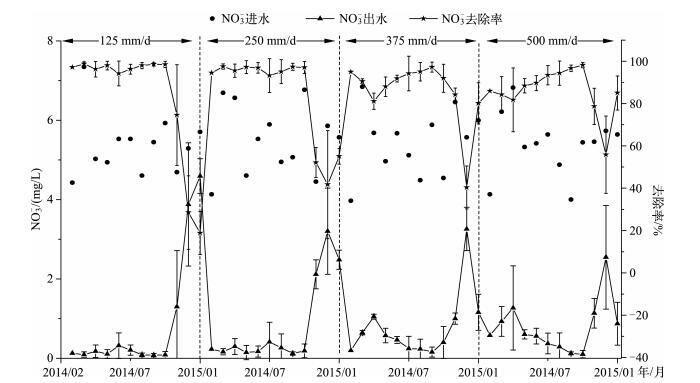 实验系统进水以污水处理厂一级A排放标准(2006年)尾水(化学需氧量(CODCr)≤50 mg/L，总氮(TN)≤15 mg/L，NH4+≤5 mg/L，总磷(TP)≤1 mg/L)为处理对象.为避免因进水水质波动造成实验结果不稳定，本实验采用人工配水，配水成分如下：葡萄糖、NaCO3、KH2PO4、CaCl2、MgSO4、FeCl3·6H2O、NaNO3、NH4Cl，进水水质数据详见表 1. 由图 2可知，湿地系统显著降低了尾水中TN的浓度.随着水力负荷的增大，TN去除率下降，4种水力负荷下对TN的年均去除率分别为71.39% ±17.71%、56.07% ±15.18%、53.98% ±10.22%和49.63% ±9.60%.从效果的月变化来看，125和250 mm/d水力负荷下TN的去除效果表现出相似的规律：从2月开始逐渐上升，在10月达到最佳，去除率分别达到91.24% ±3.46%和73.59% ±3.14%；而后于2015年1月和2014年12月分别降至最低值35.83% ±3.09%和32.62% ±8.61%.相关性分析发现，TN去除率与温度、水力负荷分别呈显著正、负相关(P＜0.01).由于湿地对氮的去除主要由微生物驱动，冬季微生物活性随着温度的降低而显著下降，故而TN的去除率显著降低. 由图 3可看出，湿地对NO3－保持着较高的去除率.分析发现，在11月以前，4种水力负荷下NO3－的平均去除率均在90%以上，而11月以后去除率显著下降，其中低负荷下下降幅度更大，此后4种水力负荷下平均去除率分别为34.81% ±26.90%、48.03% ±17.24%、63.03% ±22.94%和70.60% ±19.03% (表 2). NO3－去除率与出水温度和DO浓度的关系见图 5和6.当温度低于10℃时，4种水力负荷下NO3－的去除率急剧下降(图 5)，可能说明10℃是反硝化细菌活性的一个拐点.Misiti等和Chang等也得到了类似的结果.除了较低的反硝化活性外，冬季植物枯萎，内源碳供给和同化作用基本停止以及升高的溶解氧浓度都是导致NO3－去除率下降的可能原因.在较高的水力负荷下，出水DO浓度＜1.1 mg/L时反硝化作用明显较DO浓度＞1.1 mg/L时强(图 6)，表明反硝化的最佳DO浓度可能小于1.1 mg/L.系统出水的DO浓度在冬季与春季相对较高，植物低矮及植物的收割可能对相对较高的DO浓度起到一定的作用.夏、秋两季植物生长繁茂，显著降低了大气与湿地表面的空气对流，从而大大降低了大气的复氧作用.已有研究表明，在考虑植物本身的呼吸作用后，相对于大气复氧而言，植物根系泌氧对人工湿地的供养作用相对较弱.因而冬季的低温、高DO浓度可能是氮去除效果降低的主要原因. 湿地在4种水力负荷条件下均显著削减了进水磷负荷(图 7).在为期一年的实验期间，湿地系统对不同负荷下的尾水均保持了较好的TP去除率.随水力负荷的增加，TP去除率呈下降趋势，4种水力负荷下的年均去除率分别为76.31% ±10.61%、63.69% ±15.31%、54.10% ±17.85%和47.65% ±19.37%.4种条件下TP去除率均表现出先降后升的整体趋势.10月以后，4种条件下TP的去除率均有不同程度的提升.基质的吸附和沉淀作用是人工湿地除磷的主要途径.湿地运行初期，基质有较充足的吸附和沉淀容量，对磷的去除效能较好[18-19].此外，实验后期DO浓度升高，氧化还原电位上升，这也有利于增强基质对磷的沉淀性能.分析TP去除率与各因子之间关系发现，TP去除率与NH4+去除率呈显著正相关(P＜0.01)，与水力负荷、NO3－去除率以及出水温度呈显著负相关(P＜0.01). 由图 1、2、7可知，4种条件下湿地均显著削减了尾水的N、P负荷，其中125、250 mm/d条件下出水TP浓度均达到地表水Ⅴ类标准，375 mm/d条件下除9月外也均达到地表水Ⅴ类标准.CODCr出水在4种负荷下均达到地表水Ⅴ类标准.因此，若出水水质目标为地表水Ⅴ类，375 mm/d水力负荷在保证出水TP及CODCr达标的同时，能将处理水量最大化.为了使出水TN浓度达到排放标准，需合理改善系统的DO状况，提高其硝化效能，并辅之以适当的前/后处理措施. 由图 1、4、5及表 2可知，125 mm/d水力负荷下在全年的污染物去除率均最高，随着水力负荷的提高，污染物在系统内的停留时间缩短，出水浓度升高导致去除效率下降，这与Trang等的结论相似.因此，如以污染物去除率为标准，125 mm/d为最佳水力负荷. 式中，Q为湿地每天的污染物去除量, C进为进水污染物浓度.将式(1)~(5)代入式(6)，并让Q的导数为0，即：Q′＝0.其中Q′TN＝0、Q′NO3－＝0、Q′TP＝0、Q′COD＝0均无解，表示本研究条件下TN、NO3－、TP、CODCr的去除量均随HLR的增加而增加.因此在HLR＝500 mm/d时，TN、NO3－、TP、CODCr达到最大单日去除量.Q′NH4+＝0时求得H1＝0.261、H2＝0.354，H1＝0.261、H2＝0.354时分别取得极大值与极小值，而H＝0.5时Q0.5＝0.66g/(d·m2)＞Q0.261＝0.52g/(d·m2)，因此，HLR＝－0.5 m/d＝500 mm/d时NH4+单日去除量也达到最大值.各指标单位面积单日最大去除量见表 4. 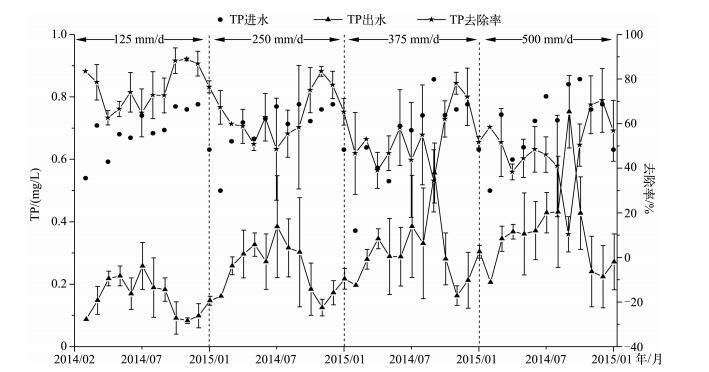 4种水力负荷下TN、TP的去除率均有显著差异(P < 0.05)，250、375、500 mm/d水力负荷下CODCr去除率无显著差异(P >0.05)，其中125 mm/d下的去除率显著高于其他水力负荷下的去除率，而250与375 mm/d下TN、TP去除率差异不显著(P>0.05)，125与375 mm/d水力负荷下CODCr去除率较250及500 mm/d下的高.综上所述，综合考虑处理水质要求、去除率和污染物去除量，建议的最佳水力负荷为375 mm/d. 通过对2014-2015年垂直流人工湿地在不同水力负荷下对尾水深度处理效果进行评价，以期为人工湿地深度处理尾水的工程实践提供科学依据. (1)垂直流人工湿地能显著削减尾水中的氮、磷等污染负荷，其中TN在秋季去除效果最佳，去除率分别为86.62% ±6.87%、64.73% ±12.68%、59.13% ±9.13%和49.88% ±11.61%，冬季效果最差，去除率分别为45.78% ±14.43%、35.98% ±7.18%、42.51% ±9.50%和44.29% ±9.16%；TP在冬季去除效果最佳，去除率分别为83.81% ±6.64%、74.55% ±8.82%、65.95% ±13.45%和64.27% ±13.57%. (2)TN、TP去除效果均随水力负荷的上升而降低.除125 mm/d下CODCr去除率显著高于其他水力负荷外，其余水力负荷下CODCr去除率差异不明显. (3)以湿地处理后的主要污染物满足地表水Ⅴ类标准，同时兼顾污染物去除量的情况下，375 mm/d是最佳水力负荷. 管策, 郁达伟, 郑祥等. 我国人工湿地在城市污水处理厂尾水脱氮除磷中的研究与应用进展. 农业环境科学学报, 2012, 31(12): 2309-2320. Tanveer S, Rumana A, Abdullah AM et al. Treatment of tannery wastewater in a pilot-scale hybrid constructed wetland system in Bangladesh. Chemosphere, 2013, 88: 1065-1073. Mitsch WJ, Gosselink JG. Wetlands. 2nd ed. New York: John Wiley and Sons, 1993, 135. Kadlec RH, Knight RL. Treatment wetlands. Boca Rato:Lewis Publisher, CRC Press, 1996, 595-596. 国家环境保护总局《水和废水监测分析方法》编委会. 水和废水监测分析方法. 第4版. 北京: 中国环境科学出版社, 2002, 210-280. Gagnon V, Maltais LG, Brisson J. Treatment of hydroponics wastewater using constructed wetlands in winter conditions. Water, Air, and Soil Pollution, 2010, 212(1/2/3/4): 483-490. Lin YF, Jing SR, Wang TW et al. Effects of macrophytes and external carbon sources on nitrate removal from groundwater in constructed wetlands. Environmental Pollution, 2002, 118(3): 413-420. 凌祯, 杨具瑞, 于国荣等. 不同植物与水力负荷对人工湿地脱氮除磷的影响. 中国环境科学, 2011, 31(11): 1815-1820.